Care for the children of family members in prison. Work to hold together and meet the needs of a family that is often broken apart and fragmented. Are forced to provide for themselves and the family with limited and often reduced financial resources. Frequently experience social stigma and shame. Feel voiceless and powerless, which may lead to mental issues of anxiety and stress. But women with incarcerated loved ones aren’t the only ones who face these hurdles and challenges. Others include single mothers afraid for their children’s’ futures, mothers who have lost their children to gangs and gun violence, and women who have served time themselves and are trying to get reacquainted with their families and society. Providing the consistency and strength in this alternate world that is needed for their own well-being, and that of their children, can be both emotionally and physically draining. I have the privilege of being with many of these women in Bridgeport, CT at a monthly support group meeting called Her Time. 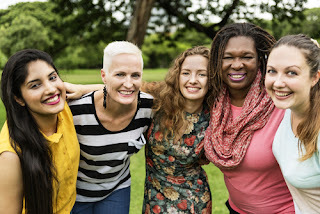 In this safe and supportive place, ladies find comfort in knowing that others deal with similar struggles and they don’t need to navigate alone. Her Time is the sister program to Hang Time, which was founded in 2014 by Charles Grady, to provide men a forum to address the issues they face as they transition from incarceration back to society with the goal to pursue a second chance at life. Both Hang time and Her Time act as hubs for resources such as jobs, career trainings, PTSD support, housing, education, and community service. Her Time focuses on the empowerment of women. The goal of Her Time is to provide an educational space for women to learn from one another, openly express themselves without fear of retribution or ridicule, and draw support from this unconventional cohort of women. They are served a nutritious hot meal, and childcare is provided in a delightful child-centered playroom. Speaking with these special women is inspirational. I don’t hear the blame game played, but I do hear enthusiasm for topics being discussed. I see an eagerness to learn new things that will benefit themselves and their families. I see women of all ages, from early 20s to grandmothers, interacting and learning from one another. I see a spirit of warmth and friendships being carved out of disparate life situations. Most of all, I see hope. 2.7 million children have one or both parents incarcerated (2010 Pew Charitable Trust). Children of incarcerated parents often experience weakened parental ties and multiple caregivers. They are also at greater risk of being placed in foster care, with the potential of permanent termination of parental rights. Negative impacts on children include increased aggression; increased delinquency among older children; anxiety, stress, fear, and depression; academic decline; shame and social stigma; survivor’s guilt; and low self-esteem. Wow…that’s quite a laundry list of terrible outcomes associated with the incarceration of a family member. Sadly, there are not enough in-depth, targeted longitudinal studies to understand these problems that can provide enough solid data for effective lobbying for change. Hopefully that will happen soon, but it will not be soon enough for many of these families. What we do know is that it’s important to have an outlet to express fears and frustrations, such as Her Time provides, and hopefully find solutions that work for the ladies who faithfully attend each month. In 2006, the Council on Crime and Justice issued a report stating, “Support groups could be tremendously helpful in bringing together caregivers and/or children in a safe environment where they can be open and honest…it requires a person or agency to initiate it, some advertising, and a space to meet.” Through the efforts of Charles Grady, Hang Time's leadership, Shamare Holmes, and other Her Time volunteers, and the generosity of The Center for Family Justice (https://centerforfamilyjustice.org/), this is what Her Time does. Hopefully, in time, their alternate world will cease to exist and they will emerge unscathed into a kinder world. More sponsorships are imperative to keep this wonderful organization viable and operating. I encourage anyone interested in providing support such as meals or money, to please contact Shamare Holmes at hertimebpt@gmail.com, Program Director of Her Time, or me, Lucy Baney (lucyb@atghome.com). For those interested in launching a similar program is other cities, we encourage you to do so and we would be happy to share our own experiences and insights. Lucy Baney is a co-founder of the Soft Skills Builder blog, and also serves as the President and CEO of Access Technologies Group, Inc. (ATG). ATG's core products and expertise are in technology- and classroom-based "soft skills" training. The company has extensive experience helping public, private, and non-profit organizations develop — in both incumbent and potential employees, including people with employment barriers — the attitudes and behaviors necessary to enter, re-enter, and succeed in the workplace. Our focus is on addressing the deficiencies reported most by employers: the interpersonal abilities and personal qualities needed to succeed across all occupations and industries. Contact Lucy at lucyb@atghome.com, or visit our website at http://www.atghome.com, for more information.